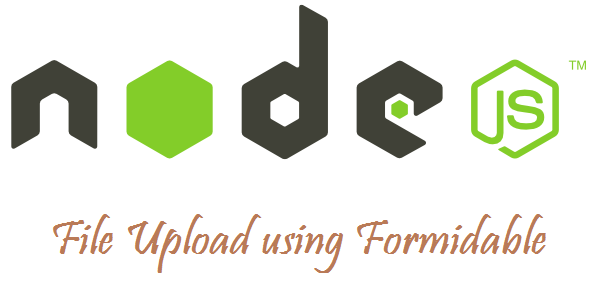 In this tutorial we'll learn how to upload file in Node.js using Formidable. Let me introduce you with Formidable - Its a node.js module used for parsing form data, especially file uploads. Detail description about Formidable is given here. A simple example has already been given there. We'll use the same in our tutorial. The code for file upload process is very simple and easy to understand.In very first step we will create node.js server which display our file upload form. Above code will display simple file upload form without any processing.Now Formidable will come into the picture for file upload processing. // creates a new incoming form. In above code we're checking that the requesting url is '/upload' and the method is 'post'. After that we are using the parse method in order to process the incoming node request. Using the util.inspect method, we just output the processed form details to the browser. On Running the above code on my machine,it displays the following in the browser. As you can see the file has been uploaded to a temporary directory in my 'Users' folder with the name '2ebf41af0b2d926432c16c70ae8f6de4'. Now we'll copy the same to our desired location. To accomplish this we need to use the node 'fs-extra' module, which makes it easier to copy files in node.js. That's it...!! just run the this file through command and go to http://localhost:8080 , upload any file. It will be uploaded and copied to your destination folder. If you like this post, then please share it..